The First of Its Kind – Bee Line Support Opens Groundbreaking Medical Cleaning Training Center! Don't just meet expectations. Exceed them. Bee Line Support, doesn't believe in playing small. Whether they're expanding their team to cover 150 new medical locations, certifying our management in the top infection prevention education, or putting protocols in place to audit their own cleaning staff, they will stop at nothing to prove our unparalleled value. This dedication to being the highest-rated medical cleaning team in the Midwest is exactly what prompted their latest expansion project. After moving their operations to a brand-new Headquarters in Chicago in the beginning of 2018, they had a lot of decisions to make about how best to utilize their space. Which brings us to this very moment. Drum roll please…. 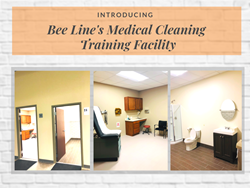 because Bee Line is now able to introduce their brand-new, fully operating Medical Cleaning Training Room Suite! Thanks to the advice and guidance from one of their most valued national medical partners, they were able to build a medical exam suite and bathroom that precisely mimics the dimensions, equipment, design and functionality of a real-life exam room. We're talking the same tile, the same back splash, everything. No detail was too small for this build-out! Don’t think they’ve left out the top dogs! They hold all employees, no matter their title, to the same high standards, and will be testing upper management and leadership on their knowledge of cleaning protocol and high-touch points as well. They can teach staff how to properly conduct a full terminal clean, moving throughout the room in a way that’s most productive and safe, leaving the room completely spotless once they’re done. Interested in working with the industry's leading experts in cleaning? Contact us today!